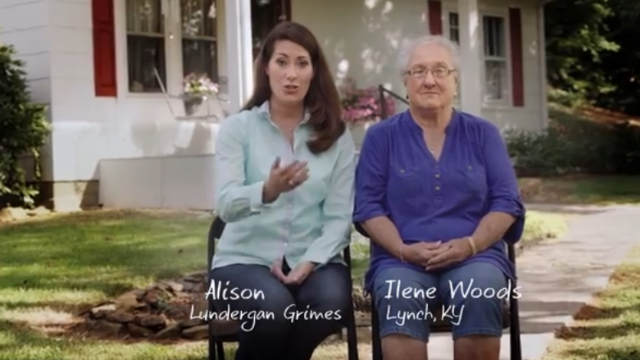 After a long pause, Grimes, sitting with Woods in a yard outside a white home, says, "I can never get him to answer this one, either.” Grimes then says McConnell must be forgetting that over half of Kentucky voters are women. McConnell's campaign argues he has supported the Violence Against Women Act in the past, and was an original co-sponsor of the law. They say he voted against reauthorization in 2012 because he opposed the Democrats’ version to expand the law. He voted against it once before because it was attached to an assault weapons ban he opposed. Democrats nationwide are trying to win over female voters in November by painting their GOP opponents as weak on women's issues. This strategy is heightened in Kentucky, where Grimes is trying to unseat the Senate minority leader by trying hard to appeal to fellow women. A McConnell source admits that late last year there was a significant gender gap, but tells CNN that internal McConnell polling shows that closing - with McConnell now doing as well as Grimes now with women voters. Three months before Election Day, polls show the race neck and neck. McConnell is just as anti woman, as his former secretary of labor wife is anti worker! Unseating McConnell would be the mother of all upsets, but she's got the best shot anyone's had in several elections. The far right and far left can make all the predictions they want about this election but at this point it is too close to call. The worst part, of course, is the safe prediction that far too many incumbents will be elected. Lets see. Romney lost the female vote to Obama in 2008 by what 11 or 12 points? The GOP is working hard to make the percent spread even wider. Keep on attacking women's rights, limiting access to affordable health care, , keeping their kids from decent public education, and limiting their access to birth control. The GOP would rather give corporations more "personhood" than women. Here's a tip, GOP- you can't win elections when you assault half of the population. Add in the loss of virtually all minorities and 2014 is going to look very different for you. Mitch McConnell should step aside , he is an elected dinosaur and a lobbyist for china . His wisdom vanished along with that of GW Bush and the Texas Rangers . Didn't mcconelly said his first agenda was to make this president a one term president, other than doing his constitutional oath of making the citizens of our great country lives better. I wonder what do you have to do to make the main leader of our country a failure, since this country has three leadership heads. I guest the only way that can happen is if one of the leaders decide to do things to make the country go off the edge and blame the main leader, what is that word i am looking for, oh yes SABATAGE. The KY guy married money. All he cares about is what his wife will leave behind when she bites the dust. The leader of the failed "one term" doesn't care about anything but his cushy life style thanks to the endless years of doing nothing in congress.